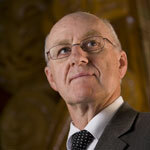 Responsible for implementing and designing the TŌKU REO course, John Moorfield (BA (Auckland),MEd (Wales), LittD (Otago), DipTchg, RSA/Cambridge CTEFLA) is currently a professor in Māori Innovation and Development at Te Ara Poutama, the Faculty of Māori Innovation and Development at Auckland University of Technology. Moorfield is a specialist in Māori language, literature and culture. Included in his publications are a series of four graduated textbooks and resources teaching Māori to teenagers and adults called Te Whanake. Teachers’ manuals, audio tapes/CDs, videotapes, study guides and a dictionary/index (hard copy and online) accompany the textbooks. The series is now widely used in tertiary institutions for learning Māori. Recently the four textbooks have been rewritten as second editions and an online resource for independent learning has been developed to complement the other resources of Te Whanake. Moorfield has also published a dictionary, Te Aka Māori-English, English-Māori Dictionary and Index. In 2006 this dictionary was made available free online and new entries continue to be added. Before joining AUT University John Moorfield was a professor in Te Tumu, the School of Māori, Pacific and Indigenous Studies at the University of Otago for ten years. Prior to that he spent 21 years at The University of Waikato as a Lecturer, Senior Lecturer and Associate Professor. He has also taught Māori at New Zealand secondary schools.